The glittering city-state of the Côte d'Azur, Monaco is nothing if not glamorous. It's steeped in enchanting history and saturated with yachts, sports cars, and designer everything. The entire country spans less than a full square mile, which makes for a perfectly walkable day trip. While you could visit the beach, you'll probably divide your time between dazzling Monte Carlo and charming Monaco-Ville. Place du Casino is the heart of Monte Carlo - you'll know you're there when see this fountain surrounded by Café de Paris, the Monte Carlo Casino, the Hôtel de Paris, and the Monte Carlo Pavilions. This square is always bustling with a hubbub of sightseers, casino-goers, and fancy cars. Even a quick bite at Café de Paris is pricey, but the people (and car, and handbag) watching is unlike anything else. When your senses are officially overloaded, duck out of the square and make your way to one of Monaco's many gardens. This side of town, you'll find the Jardins de la Petite Afrique and the Jardin Japonais. If you prefer some air-conditioned window shopping, head to Le Metropole - but skip the tiny Ladurée outpost here! For dinner in Monte Carlo, visit the classic Le Bar Americain at L'Hotel de Paris or Sass Cafe - a piano bar with a magical terrace. Leaving Monte Carlo, walk along the coastline towards the harbor to marvel at the incredible views and the sheer number of boats you can see. Catch the Bateau Bus to cross the port, or continue walking around to the Rocher de Monaco - the massive rock that holds Monaco-Ville more than 200 feet above the sea. If you have the time, stop for ice cream along the way and maybe even visit the Jardin Exotique. 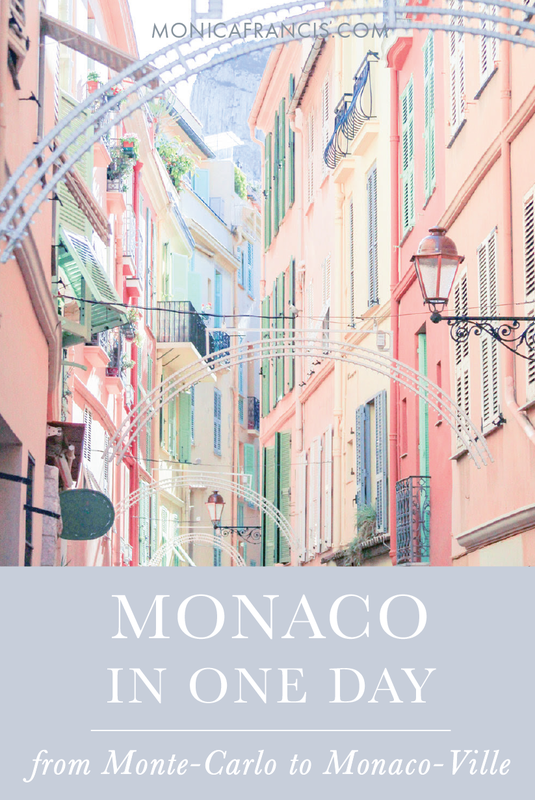 Monaco-Ville is the country's historic city; the narrow stone streets are lined with colorful buildings, filled with shops and restaurants. Tucked among the winding lanes you'll find Saint Nicholas Cathedral, where Grace Kelly was famously married to the Prince Rainier III in 1956. Across the street are the Jardins de Saint-Martin, where you can see Port de Fontvieille and catch a glimpse of the Princess Grace Rose Garden. Monaco-Ville is also home to the Prince's Palace, where the changing of the guard takes place at 11:55am each day. During the summer, the elaborate State Apartments inside the palace are open for tours, and you can also visit the private royal collection of antique cars. In the heat of the afternoon, the renowned Oceanographic Museum is a perfect escape. The building itself is stunning - a palace rising out of the sea - and each floor is full of exotic sea life and an impressive collection of specimens. After exploring the museum, head up to the rooftop for some of the best views in Monaco. For dinner in Monaco-Ville, find a table at a streetside cafe like Le Petit Bar or La Tavernatta.